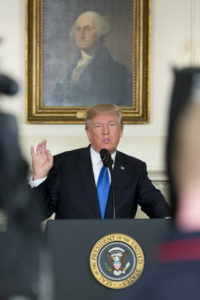 Israelis on both sides of the political aisle were supportive of the move by Trump, while Palestinians in Gaza burned the American flag ahead of the anticipated announcement. 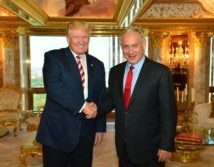 Trump acknowledged in the comments, which were posted to the White House website, that “most people would say there’s no chance whatsoever,” but he believes in Netanyahu and the Palestinian leadership. 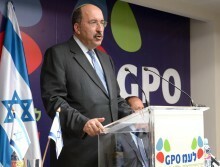 Israel Foreign Ministry Director General Dr. Dore Gold. 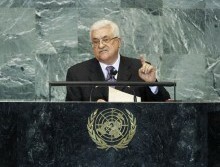 Photo credit: Israel Government Press Office. Illustrative purposes only. Israel has seen this before: World powers believing they have a model that will redesign Middle East borders without concern for those who live there. 100 years ago, Europe tried to divvy up the Middle East. Today, France is spearheading an effort on Israel-Palestinian peace that oddly enough didn’t invite Israel or the Palestinians to the opening meeting. Israeli Foreign Ministry Director-General Dr. Dore Gold already knows how this plan will go, just based on what happened last time. Considering the two main Palestinian political factions split up in a violent confrontation that saw blood shed in the streets, it’s a big deal when they can apparently agree on a new joint prime minister for a unity government. It’s an even bigger deal when an official from one of the groups says there aren’t any disputes on creating that government.